I didn't know him long but I knew him deep. I finished the training to be a hospice volunteer at the end of December, and the Volunteer Director called on January 3rd to say he had a patient that might be a good match for me. He described a man named Abraham, who, at 90, had opted to live out the last months of his life in his home, under hospice care. Though his prostate cancer was quite advanced, he was not in pain and the hospice staff thought he might enjoy some music. My specialty. I put my guitar in the trunk of my car and followed the directions to a garden apartment on the river. The sun was shining brightly off the water and I paused for a moment before I went inside. I felt the need to connect with the earth, with nature, with the Universe, with myself. I set my intentions for the visit and said a short prayer. Noticing but not surrendering to my nervousness, I rang the doorbell. Abe's wife, Helane, greeted me warmly at the door and led me to the den to meet Abe. He was sitting in a recliner by the window, his light blue flannel pajamas matched his eyes and wisps of white hair matched his mustache. There was an old guitar resting across his lap. He twinkled a hello and held out the guitar for me to play. 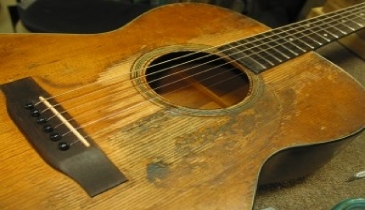 It was a 1942 Martin, well worn and in tune. He handed it to me in a true act of trust and friendship, and I accepted. The next few hours were a treat. Abe was a "folkie" from way back. So we shared old folk songs, just like the hootenanny days. I don't know who had more fun. The music connected us, note by note. As I was getting ready to leave, I asked Abe if he'd like me to come back next week. He said, with his impish smile, "I got nothing else planned. I'll be here." "So will I," I assured him. And so began the love affair of the century. At least for me. Each week, I brought my guitar and we sang and sang and sang. I once told him that he'd probably keep me there till midnight if I let him. He told me I was wrong – that he was actually trying to get me to stay into the next day. Sometimes, a song would spark a memory and he'd tell me stories about his time in France when he was in the Army, or about growing up on the Lower East Side of New York and the Madison House Settlement, or about some of his old friendships and adventures. On the best days, he'd talk about his favorite subject of all, his grandchildren. "Isn't that some meatball?" he'd say with a wink, pointing to a picture of his grandson, Gregory. "Well, I don't know if I'd call him a meatball," I replied. "You got a better name for him?" he teased. "Well, actually, no, I don't." And I didn't. What I didn't know then, I know now. To Abe, all of the people he loved were meatballs. In time, even me. Week after week, we shared stories and songs. We both looked forward to it. It was sacred time and I delighted in my new friend, and truly loved our time together. Of course, all through it, I knew I'd lose him. That was part of the bargain. Whoever said life was fair? On a particularly memorable day, in the midst of our singing and reminiscing, Abe started singing an old Yiddish song that his mother used to sing to him. He couldn't remember all the words and was getting frustrated. "I'll get it, I'll get it. It's right here…I just can't seem to grab it as it goes by." "Don't worry about it," I said. "I'll just strum some chords and you just sing whatever you feel like singing." In that moment, our incredible adventure into the unknown began. I provided some musical foundation for his improvisation. I don't know how long it lasted, but when the song came to it's natural conclusion, we were both exhausted. I looked at him at said, "That was amazing. We were on a musical journey together, you and I. Do you have any idea how long we were at it?" He shook his head. "Neither do I. But I do know that all during it, time stood still." He agreed wholeheartedly. We both knew that we had shared a special moment, and whatever music we made would continue on forever. Sometimes I'd have to help Abe get out of the chair to go to the bathroom. I'd hold him under the shoulder onto his back to support him as he rose. Once on his feet, he'd drape his arms over me and settle in for a good, long hug. After a while, I'd gently remind him why he was standing, though I hated to end the hug. The hallway to the bathroom was filled with photomontages of Abe and Helane's life. At first, there seemed to be too many pictures and too many people to deal with. In time, as I'd wait for Abe, I started to recognize his children and grandchildren in their various stages of growing up. There were pictures of family gatherings through time – Abe and Helane's 60th wedding anniversary, Abe's 80th birthday, and other milestones. I once told Helane that I loved the fact that they didn't keep their photos in albums, but on the walls so they could enjoy them and share them. I remember arriving one day in February and found Abe, paler than usual, in his bed instead of the recliner. As I sat opposite him, he seemed to want to talk more than sing, so I sat back and listened. Some new stories, some repeats. He delighted in sharing them. After about an hour, I found myself thinking about how I'd probably never see him up and around again, that this was the beginning of the end. I was overwhelmed with sadness. But because the job of hospice volunteer does not include dumping my grief on the patient, I kept it to myself, hoping he didn't notice that my eyes were filled with tears. If he noticed, he never said a word. But I'm sure he understood. In fact, that's part of what made our connection so powerful. He knew I knew he was dying. And I knew he knew I knew. And we sang. Sad songs. Happy songs. Old songs. Silly songs. I'd share my original songs with him and he'd say, "That's good – I like it," and give me a wink with those incredibly delightful blue eyes. Though he was growing weaker, Abe continued to participate in our songfests in his own way. Sometimes, I thought he was dozing until I'd catch sight of his finger waving back and forth in time to the music. Other times, he'd let his slippered foot keep time on the footrest. Once, I giggled when I saw his finger move and commented on how I'd thought he was sleeping. With the barest hint of a smile, he lifted a second finger and began conducting in earnest with two fingers raised. Meeting Abe's son, David, was a special moment for me. I walked into the apartment and heard a man talking on the phone. He took one look at me (and my guitar), hung up the phone and with a huge smile said, "You!" I recognized him from all of the photos, and replied, "You!!" I was then enveloped in one of the most genuine bear hugs I'd ever experienced. It was amazing to me to feel love from someone I just met. But of course, we knew each other well. Weeks passed, and the mild winter unfolded a day at a time. I arrived one Tuesday in March at my regular time. Helane met me at the door and said that Abe was sleeping. He'd had a rough weekend that had taken its toll on him. I went into the bedroom and watched his breathing body, a whisper of his former self. It was clear to me he was slipping away, a fragile thread of life between his fingers. He didn't respond to Helane when she told him I was there, he didn't respond to his favorite songs, he didn't even respond when I squeezed his hand hard and told him I loved him. He died later that night with his family gathered around him singing "Kumbayah" and "Will The Circle Be Unbroken," peacefully taking his exit among the melodies. For the next few days, I nursed my sad heart, already missing my twinkling friend. Those around me tried to comfort me as best they could, but most felt the need to tell me "this is the nature of the work you chose." As much as I knew that, their admonitions did little to ease my sadness. Abe's family asked me to share a story and a song at his memorial service. Of course, I accepted. Helane suggested one of my songs, "God is the Sun, God is the Moon." His son, David, asked for "Gathering of Angels" or "Zachary Aaron." But I knew the song I would sing hadn't been written yet and while the service was only a few days away, I decided to try to write a new one. I struggled with a few verses and some pleasing melodies, but they weren't right. Then I got smart and called on Abe to help me. Suddenly, my fingers knew just what to do and I started strumming the chords that had supported our musical journey. The words tumbled out easily. I finished the song the day before the service and was nervous about learning it in time. I made a rough recording of it and played it as I drove to a friend's house for dinner. On the way home, I popped the tape in and sang the song a few more times. Halfway home, I suddenly had the urge to change my route. Instead of staying on Route 9, I cut through Dobbs Ferry toward the Saw Mill Parkway, rationalizing my action by convincing myself it would get me home faster. Singing and listening and driving, I headed down Ashford Avenue toward the parkway. Something caught my eye on the right and I looked up in time to see the sign for the funeral home where the service was to take place the next morning. The hair on the back of my neck stood up. Abe was inside that very building. He must've wanted to hear the song before the funeral and got me to turn my car in his direction! His memorial service was the most wonderful, heartfelt celebration I'd ever attended. Rather than religious formalities, his family had opted for a homegrown service, with members of the family and friends telling Abe stories, sharing their memories and their love. John, one of his sons-in-law, sang a special version of "Ramblin' Boy," accompanied by his daughter-in-law, Diana, on violin. One by one, Abe's children and their spouses told wonderful stories of a loving father and his grandchildren expressed their sadness over losing their special, wise "Poppy." Helane told the story of how they met and painted a loving picture of their years together. I shared the story of our musical journey and, using Abe's guitar, sang "Abe's Song" for the first time. There wasn't a dry eye in the house…including mine. What a relief to find a way to let go of the grief, floating it on the notes of a song inspired by the very man we were there to mourn. Is separate from the sea. But that's not what I believe. Are nothing but some light. A new star out tonight. After the "formal" part of the service, people stood to share their memories, speak their love. One man in his 50s stood up and said, "I'm Dave, one of Abe's nephews and I just want to say that he told me I'm his favorite meatball!" Another nephew rose to declare that Abe had told him he was the favorite meatball. And on and on until laughter mixed with salty tears and we sent the casket off for its final journey singing "Goodnight, Irene." Abe's body might have been inside, but his spirit was with us in that room. The legacy he left behind was love, and it was palpable. We all went back to David and Diana's house for something to eat. There, on the table next to the coffee urn, was the biggest, most beautiful chocolate cake I'd ever seen. In yellow icing, neatly written in script, was the inscription: "To Poppy, With love, All the Meatballs"
Life is pretty much back to normal now. I have another hospice patient to sing with and though it's not the same, Mary loves the music, too. And I suspect I'll be singing "Abe's Song" at many memorial services to come, always holding the special place in my heart for the original meatball.